Rana Daggubati, Tamannaah, Kajal Aggarwal and Aditi Rao Hydari, are audiences favourite down south. The fabulous four have come together for a group selfie and social media buffs are totally loving it. The four celebs came together for the auspicious occasion of Maha Shivratri 2019, which was yesterday (March 4). While many other celebs took to their social media handle to post wishes to their fans, these four shared a picture and wished their fans. Mahashivratri 2019: Mahesh Babu, Dhanush, Amitabh Bachchan, Akshay Kumar Wish Fans on The Auspicious Occasion. 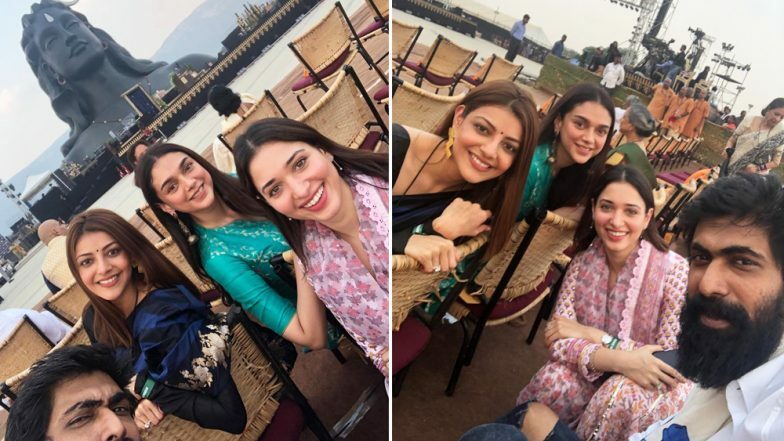 The picture was shared by Kajal Aggarwal on Instagram. She captioned it as, “Best way to celebrate #Mahashivratri @sadhguru @tamannaahspeaks @ranadaggubati @aditiraohydari”. Before putting up the picture, Kajal had tweeted, “Ishaana Sarvavidyanam Ishvara Sarvabhutanam Brahmadhipati Brahmanodhipati Brahma Shivo Me Astu Sadashivoham Wishing you all a happy #Mahashivratri!! #HarHarMahadev.” They celebrated the occasion in Coimbatore. The ladies looked simple and beautiful in the traditional attire. Superhit Duo Allu Arjun and Sukumar to Collaborate After Nine Years, Third Project After Arya 2. On the work front, Rana Daggubati will be seen in the tri-language film Haathi Mere Saathi, bi-lingual period Madai Thiranthu / 1945 and a comedy film Housefull 4. His last film N.T.R: Mahanayakudu did not perform well at the box office.